A favorite breakfast and snack in our house is homemade yogurt. My daughter eats it plain without any sweetener. We put it in smoothies, top it with fruit or granola, and add it to muffins. I’ve been making it for several years now. Why make yogurt? It’s cheaper and there are no added ingredients. Plain yogurt is one of those products you shouldn’t have to read the label on when you are shopping. Unfortunately though, you do. It’s so simple. The actual labor of making yogurt is pretty much nothing. Most of the time you are just ignoring it. Yogurt is something you should add to your “make from scratch” list. 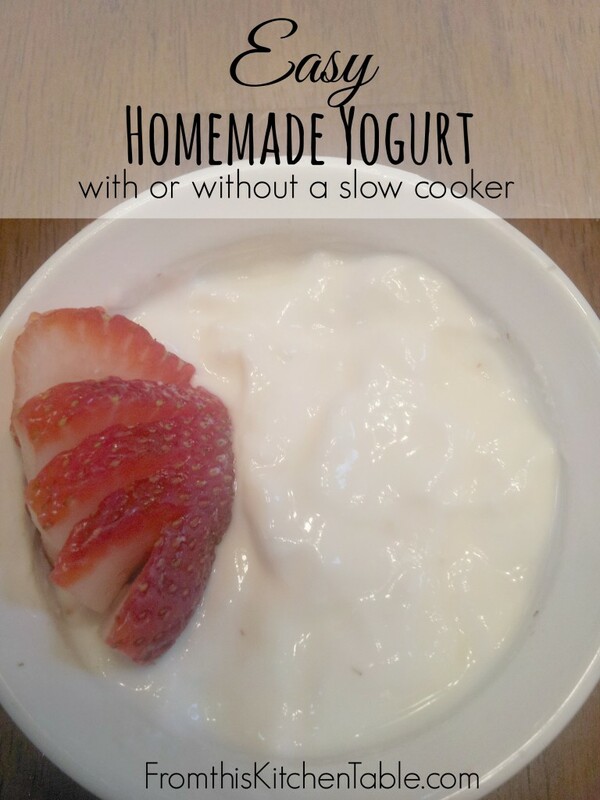 I use my 6 quart slow cooker from start to finish to make my easy homemade yogurt. A friend uses the same method but does it on the stove in a heavy pot. The slow cooker would give a little better insulation during the setting period. You can also place it in a warmer location – such as a (turned off) oven when the light turned on. Use Whole Milk – I always use whole milk and my yogurt thickens enough for our tastes. It does turn out thicker in the summer when the house stays warmer though. If the yogurt isn’t thick enough for you or you choose to use a lower fat milk, you can do one of the following options. Strain – Strain it to your desired consistency using a tea towel or cheese cloth. Obviously you’ll end up with not as much yogurt using this method but you can still use the liquid you strained off for baking, smoothies etc. Gelatin – Add 1-2 teaspoons of gelatin (details on how to do that when we get to the recipe) to have your yogurt set up really well. Slow Cooker Method: Pour 8 cups of milk into your slow cooker, cover, and turn to low. Stove Top Method: Pour 8 cups of milk into a heavy pan and turn stove to low. With Thermometer: Heat to 180-185 degrees and turn off heat. Slow Cooker: This will take 2 – 2 1/2 hours covered depending on the temperature of your house. Stove Top: If you do it on the stove, stir it occasionally during the process to keep it from scorching on the bottom. With Thermometer: Let the milk cool down to 115 degrees. I like to make sure mine isn’t any cooler than that because I’ve found it won’t set up as well for me. You don’t want it to be too hot though otherwise it will kill the cultures in the yogurt when you add it. Without Thermometer: Go by touch! You should be able to easily stick your finger in without burning it. The milk should feel a little hotter than just warm though. 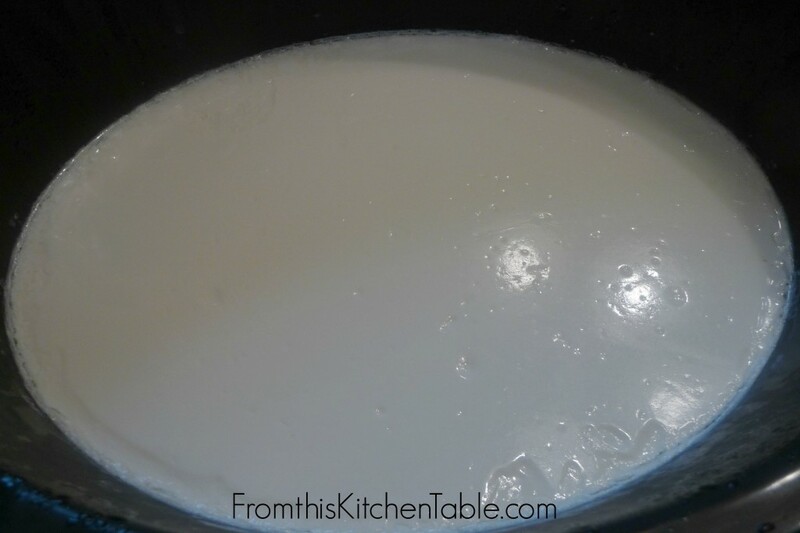 Scoop out 1-2 cups of the warm milk and stir 1/2 cup of plain yogurt (with active cultures) into it. Pour back into the slow cooker or pan and stir together. If you want to add gelatin for a thicker yogurt, now is the time to do it! Simply sprinkle 1-2 teaspoons of gelatin over the top of the milk and gentle whisk it in. Then proceed to step 5. Replace lid on the cover slow cooker or crockpot with several heavy towels to keep it insulated. I cover my slow cooker with 3 big towels and leave it on the counter over night. If you are using a pan, you might want to cover it with towels and place in the oven with the light on or in a cooler to help keep it insulated better. Let your milk/yogurt sit insulated for 8-12 hours. I’ve found closer to 10 hours is better for the yogurt to turn out thicker. Transfer yogurt into your food storage containers and keep in the refrigerator. Top with fruit, granola, jam or even eat plain. If you want, you can sweeten to taste using a drizzle of maple syrup, honey or other sweetener of your choice. Do you make yogurt? What’s your favorite method? 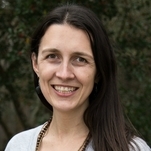 This entry was posted in Uncategorized on May 9, 2014 by Deanna Michaels. We spend way too much money on yogurt… particularly, vanilla yogurt! Do you know if it’d be possible to infuse it with an extract? Or even a bean? I have added vanilla extract to the yogurt after it was completely finished. I bet it would be tasty to add a split open vanilla bean in at the very beginning. I’ll have to try that next time. Thanks for stopping by! Wow that is really thick! Mine is usually runnier. Maybe I need to let mine sit out longer or add more towels. I usually just use one. I start mine on the stove to heat it up and then pour it in the crock pot liner to let it sit. I know this makes double the amount of dirty dishes, but I feel like in just the crock pot it takes so long to get hot. We love our homemade yogurt! The whole milk and keeping it warm really makes a difference. I was going to add this to the post but forgot (I should just add it now), but if you are going to heat it on the stove and then add it to the crockpot, I’d probably prewarm the crockpot just heating up water in it so it doesn’t loose temperature too quickly. Don’t know if it will make any difference or not though. And I really do smother mine with towels, ha ha. Who knows if it actually makes any difference but I figure it doesn’t hurt anything. YUM! pinning to try this. thanks so much for sharing. found at titus 2 tuesday linky. Have a great week. Thanks, Rachel! Hope that you enjoy it. 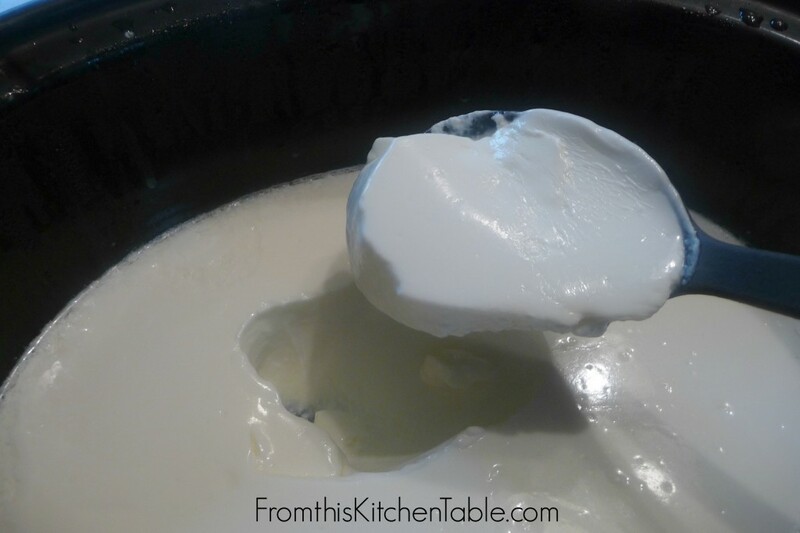 Love making homemade yogurt – super easy and customizable. I love yogurt, but have never made it. It does look easy, though, and you have inspired me to give it a try. Thanks for sharing! It is really easy to make! I love making up a big batch and eating it plain and using it in smoothies! Makes for quick and easy breakfasts. It’s so easy! You should give it a try. We’ve been enjoying eating it and drinking it in smoothies all week. It is so easy! I love having it for breakfast with granola or fruit added in. Easy and yummy! I’ve been meaning to do this for ever! Think I’ll try yours. It’s so easy! I hope you give homemade yogurt a try sometime. Thanks for stopping by. I have to try this! I would love it if you joined and contribute your awesome posts at my link party at City of Creative Dreams starts on Fridays 😀 Hope to see you there at City of Creative Dreams Link Party. Thanks for stopping by and sharing about your party! I’m going to hop over and check it out. Hope you are having a great weekend. Wow – your yogurt comes out so much thicker than mine! I’d love mine to come out so thick. 🙂 Please stop on by and share with us on Five Friday Finds (open until Wednesday midnight)! Just came across this post. I’ve been making homemade yogurt for a while now. I want to share a tip that I use often – if using low-fat milk, (or sometimes even with whole milk), the end texture can be sort of grainy, especially if you’ve strained it to make Greek yogurt. Run a hand blender through your yogurt and it will turn it silky smooth! Save the strained liquid (whey) to use for smoothies, in place of milk when baking etc., just beware that it is high in carbs! Oooo, LOVE that idea! I’ll have to try the blender next time. Yes! Using the whey is a great way to make sure nothing goes to waste. Thanks so much for commenting. Mine lasts just under 2 weeks. By the end you can tell its close the the end of its life, but I can still eat it. My slow cooker is a 6 quart one – if you have a smaller one, cut the recipe in half and just use a thermometer the first time and after that you should be able to go by times! Oh I will have to try this. I have had several attempts at homemade yoghurt and it just never seemed to turn out. But I used low fat milk and greek yoghurt. I’ve switched to natural yoghurt recently, after seeing the sugar added to the flavoured ones. So now we are trialling natural pot set yoghurt with either honey or fruit for sweetness. It’s not as nice as the shop stuff, but definitely healthier. How as your yogurt making been going? I love using the whole milk in mine. Yes, honey or fruit for sweetness is the way to go – way healthier. Agree the texture and taste is slightly different than the store stuff.